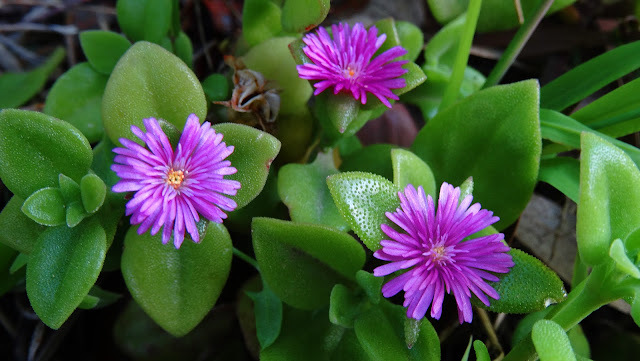 Aptenia cordifolia is a species of succulent plant in the ice plant family known by the common names heartleaf ice plant and baby sun rose. Perhaps the most common plant seen under this name is actually Aptenia 'Red Apple', a hybrid with red flowers and bright green leaves, whose parents are A. cordifolia and A. (Platythyra) haeckeliana. The true species of A. cordifolia has magenta purple flowers and more heart-shaped, mid-green, textured leaves. Native to southern Africa, this species has become widely known as an ornamental plant. It is a mat-forming perennial herb growing in flat clumps on the ground from a woody base. Stems reach up to about 60 centimetres long. The bright green leaves are generally heart-shaped and up to 3 centimetres long. They are covered in very fine bumps. Bright pink to purplish flowers appear in the leaf axils and are open during the day. The fruit is a capsule just over a centimetre long. The hybrid, Aptenia 'Red Apple', has, in some areas, escaped cultivation and now grows as an introduced species. Its far more vigorous growth and ability to root from small bits of stem makes it a poor choice for planting adjacent to wild lands as it can overwhelm native plants. 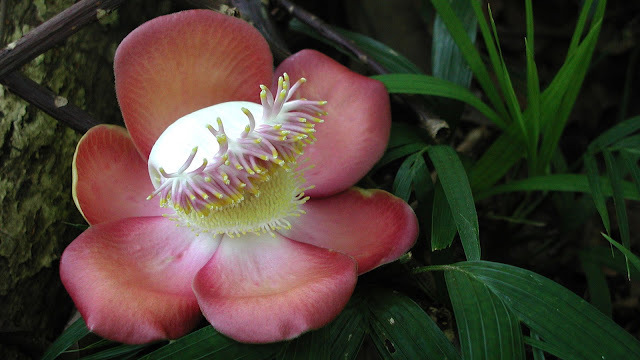 Couroupita guianensis, known by several common names, including cannonball tree, is a deciduous tree in the family Lecythidaceae, which also contains the Brazil nut (Bertholletia excelsa). It is native to the rainforests of Central and South America. The tree grows up to 35 metres in height. The clustered leaves vary in length, generally from 8 to 31 cm, but reaching up to 57 cm. The fragrant flowers are borne in large bunches up to 80 meters long. Some trees flower profusely, until the entire trunk is buried in flowers. One tree can bear 1000 flowers per day. They are strongly scented, especially at night, and in the early morning. They are large, up to 6 cm wide, and often brightly coloured, the six petals in shades of pink and red near the bases and yellowish toward the tips. There is a ring of stamens at the centre, and an arrangement to stamens that have been modified into a hood. The large fruit, which is woody and very spherical, measuring up to 25 cm wide, gives the species the common name “cannonball tree”. A smaller fruit contains perhaps 65 seeds, while a large one can have 550. One tree can bear 150 fruits. The fruit takes up to a year to mature in most areas, sometimes as long as 18 months. Illicium anisatum, commonly known as the Japanese star anise, is a tree similar to Chinese star anise. It is highly toxic, therefore it is not edible; instead, it has been burned as incense in Japan, where it is known as shikimi. Cases of illness, including serious neurological effects such as seizures, reported after using star anise tea may be a result of using this species. I. anisatum is native to Japan. It is similar to I. verum, but its fruit is smaller and with weaker odour, which is said to be more similar to cardamom than to anise. While it is poisonous and therefore unsuitable for using internally, it is used for treatment of some skin problems in traditional Chinese medicine. Cymbidium, or boat orchids, is a genus of 52 evergreen species in the orchid family Orchidaceae. It was first described by Olof Swartz in 1799. The name is derived from the Greek word kumbos, meaning 'hole, cavity'. It refers to the form of the base of the lip. The genus is abbreviated Cym in horticultural trade. This genus is distributed in tropical and subtropical Asia (such as northern India, China, Japan, Malaysia, the Philippines, and Borneo) and northern Australia. The larger flowered species from which the large flowered hybrids are derived grow at high altitudes. Cymbidium plants are sympodial and grow to a height of 60 cm and the racemes as high as 90 cm. The raceme grows from the base of the most recent pseudobulb. Each flower can have a diameter of 5 to 10 cm, according to the species. 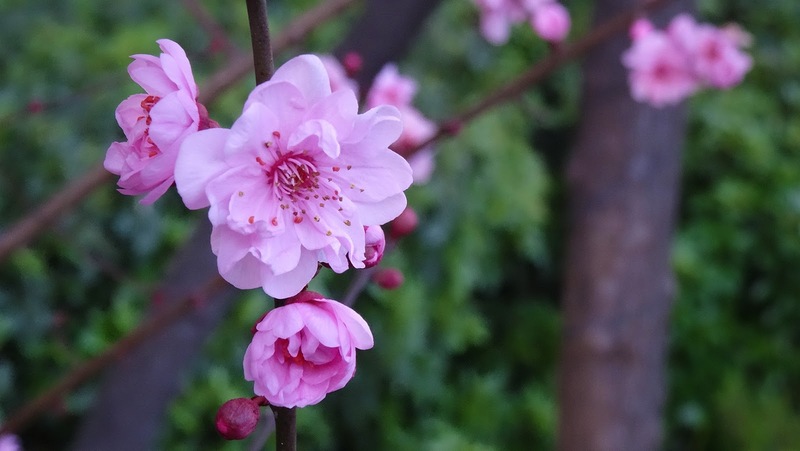 They bloom during the winter, and each plant can have up to fifteen or more flowers. The fantastic range of colours for this genus include white, green, yellowish-green, cream, yellow, brown, pink, and red [and orange] and black (and there may be markings of other colour shades at the same time), but not blue. The flowers last about ten weeks. They have a waxy texture. The rounded sepals and petals have about the same dimensions. They show very diverse colour patterns, different for every species. It is one of the most popular and desirable orchids in the world because of the beautiful flowers. These plants make great houseplants, and are also popular in floral arrangements and corsages. They have been cultivated for thousands of years, especially in China. Cymbidiums became popular in Europe during the Victorian era. One feature that makes the plant so popular is the fact that it can survive during cold temperatures (as low as 7˚ C or 45˚ F).